Nouvelle Espagne, Nouvelle Mexique, Isles Antiles. 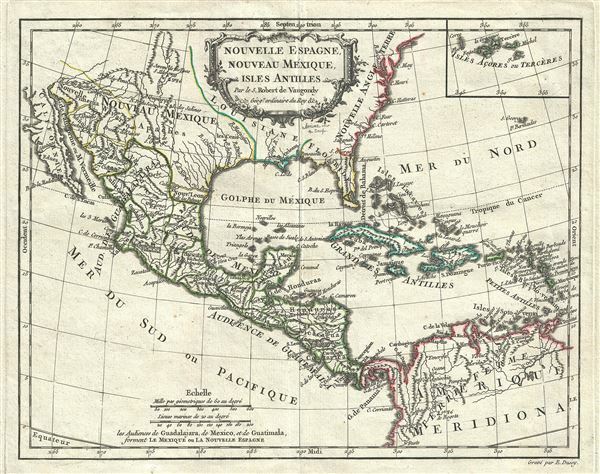 This is an uncommon 1778 map of Mexico, the Gulf Coast, Florida and West Indies by Robert de Vaugondy. Centered on the Gulf Coast, it covers from Baja California to Florida and the Lesser Antilles, and from the Chesapeake Bay south as far as Bogota in Columbia. Being primarily a map of Mexico and the Spanish holdings in North America, this excellent map details the various Mexican states naming countless towns, villages, and haciendas. The map extends northward into the vast and largely unknown American West. Vaugondy sets the Rio del Palma as the northern border of New Spain (Mexico) and the border of Louisiana just west of the Mississippi, clearly defining the regional boundaries of 'Nouveau Mexique' roughly along the lines of early 19th century Texas. The Mississippi Valley itself is poorly represented, as is Florida, whose southern top is a network of islands and canals â€' a common if primitive attempt to describe the everglades. An inset in the top right quadrant features the Azores Islands of Portugal. This map was engraved by E. Dussy and issued by Robert de Vaugondy in 1778. Very good. Original platemark visible. Minor wear along original centerfold. Minor spotting. Pedley, Mary Sponberg Belle et Utile: The Work of the Robert de Vaugondy Family of Mapmakers, 481, state 2.